I sometimes wonder if I am the most boring person I know. Each year, I look at the same trees, the same patches of mud, the same plants, the same twigs - precisely the same twigs if they are still there which, sometimes, they aren’t. Each year, I announce grandly that I will follow one of these familiar things right through the season, only to find they are chopped down, trodden on or done in by the weather. Last year, I chose a tree and took photos of the plants around it. 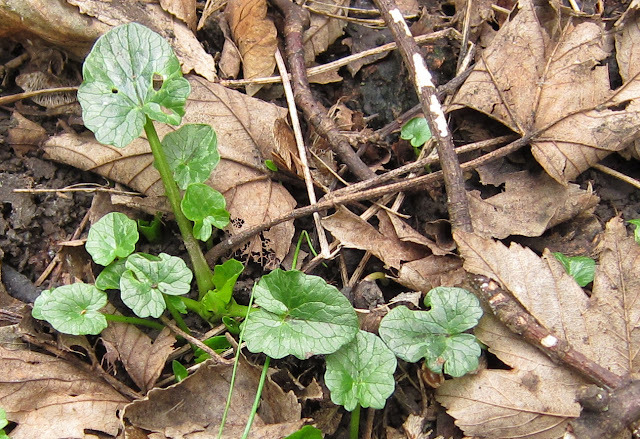 The year before, the whole area, had been plastered with Lesser Celandines (Ranunculus ficaria) in the spring. I was expecting to show you the ground as it turned yellow with bright, starry flowers. No. There was drought and the bank stayed brown and dull right through the summer and not in the least bit interesting to document because hardly anything changed. There certainly wasn’t an outburst of yellow flowers. Considering the amount of rain we have had recently, the ground was surprisingly firm - so, maybe this will be another non-celandine season. Undaunted - and at the risk of you confirming that I am the most boring person on the internet . . . I’ve re-photoed the tree and the plants immediately around it. At the very least (I hope!) the tree will grow leaves! 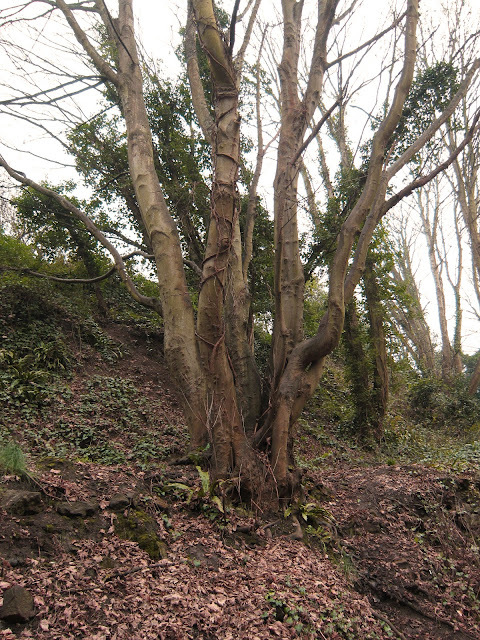 Here, then, is the context; a bank beside a path which has been built along an old railway line. The tree is second on the left. A sycamore with bare branches. Arum maculatum tucked between its toes. These are on the opposite bank but show how the plant unfurls. As the season goes by they will produce pale curving flowers (like unrolling pages) (one each) and, by autumn, these will have been replaced by pillars of bright red berries sticking up through their middles. And the jolly old Lesser Celandines (Ranunculus ficaria). This post is for Festival of the Trees Number 57. There is nothing less boring than observing the fascinating goings-on around trees! I love the exuberant growth at this time of year - it's as if everything is celebrating and surging forth! Forgive my pig ignorance, the spots on the arum leaves are meant to be there? I think I prefer arum leaves to flowers. Hello Phoenix C. I hope this year it does turn out to be interesting. Last year this project was a bit of a flop because nothing grew! Hello Diana - yes, the spots are meant to be there; that's the 'maculatum' bit in the name. ('Immaculate' means unspotted so maculatum . . . spotty!) Not all of them have these inky blodges. The ones I show which are newly coming up through the ground seem to be without them. Did you have to re-do your research only on a different rock? Hello Pat. It's great to feel connected to our immediate world in this way, isn't it? However . . . when I was out this morning, preparing this post, a man with a dog stopped and asked what I was photographing. When I told him I look at the same plants at the same time each year to see their changes - I could see he was disappointed and puzzled. I was tempted to explain about this blog - then decided plants and trees and the small things in nature are of interest in their own right whether we write about them or not - so I didn't. Hello Jack. Yes. Bark is special. I agree. I've replied to your email. Not boring at all Lucy but unique and erudite. I like your idea of focusing on one spot and noting the wildlife around which is unpredicatable and sometimes unexpected. By the way love old railway tracks - can almost hear the steam trains coming. This really sadened me, more so because I can relate to your experience. It's hard for me to leave the house sometimes because I'd walk down a street and see a house has been demolished overnight and a tree has been cut down. All I can do is sugest you choose more spots or trees in different areas to observe at the same time. It looks a very interesting tree to me and has some splendid plants around it - Lords and Ladies is lovely both in flower and when the lovely red berries appear. I only know of one small patch of it round here so I find it very exciting:) Last year I had a similar idea of following a stretch of hedgerow through the year but it never got further than an idea - maybe this year! Hello Lucy, what a lovely idea, to chart one place faithfully rather than just flit around cherry picking the best. I've been thinking about doing something similar with the hedge up at our allotment site. Rather than thinking, perhaps I should just do, just for myself, so that I can appreciate how it changes over the seasons. Look forward to seeing your tree again, with whatever plant companions decide to join the party this year. Indeed, you live in a very beautiful place to admire the beauties of nature around you in such a fantastic way. 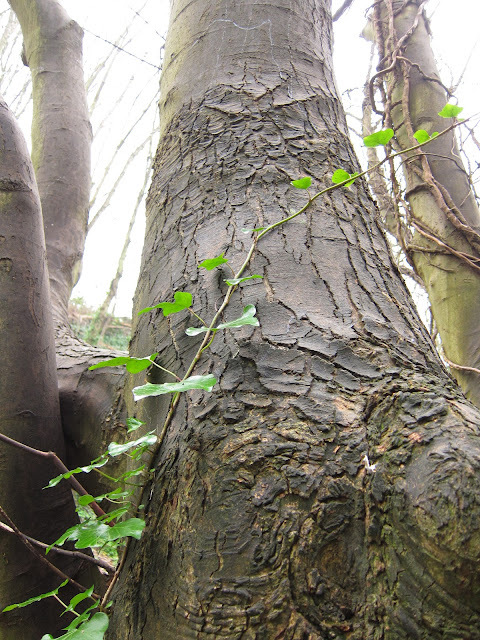 I am admiring the beauty of this sycamore tree. how old it can be. I think you can learn a lot about nature by studying it "personally" and that you shouldn't care if you think you are boring. It probably is boring to someone but that is the beauty of blogging....you can write what you want to and those that are interested will read and listen. I don't get the chance to see many of these plants growing in a natural habitat so I appreciated your efforts of blogging about them. I like your idea of focusing on certain areas. Hard to imagine Celandines not popping up - they are usually invincible if my garden is anything to go by. Thanks for the info on maculatum - that explains the naming of one of my hardy Geraniums. I think the very fact that you're worrying about being boring means that, by definition, you are not. Really boring people never seem to worry about whether they're boring the pants off you. A case of cogito ergo non molestus sum. Or something! Well they're off to a good start this year! I am getting behind with the seasons, January is over and I still haven't been out to see the snowdrops. Hello Patio Patch. One of the nice things about this old railway line is that there is a tunnel one can walk through! Hello Gabriella. This tree is, I think, safe . . . Those which are likely to shed branches sometimes do have to be felled. It's sad to see them go but I understand. Branches on bushes are sometimes cut back at annoying moments - and sometimes in raggedy ways - but they can't be allowed to grow across paths. I agree the solution to how one feels about this is not to concentrate all one's attention on the one spot. I do hope you will visit Loose and Leafy over time and get to know the different plants and their habitat throughout the year. Rowan, I do hope you have another bash at following a stretch of hedgerow through the year. I find it's astonishing how much more I notice when I do this. Plantalicious - you too! Do follow a stretch of hedge or piece of ground . . . and put it on your blog! (I know it's an allotment blog but . . .!) I think we may even be contributing something to science. Hello Mania. I agree. I am very fortunate in where I live. I don't know how old this tree is. Indeed, given its location on the side of an old railway cutting it's something I can't quite guess at. I must see if I can find someone who knows. Hello Rosey. I'm sure the people who read these posts are not bored by them. (After all, they don't need to visit!) However, people who stop to ask what I am looking at, what I'm photographing, nearly always expect there to be rare insect or beautiful butterfly. Hello Easygardener. The celandines are beginning to get under way now. (I'm writing this on 23rd February) so maybe we will have flowers this year. Hello Old Geezer. (It doesn't seem quite right to address you in this way!) 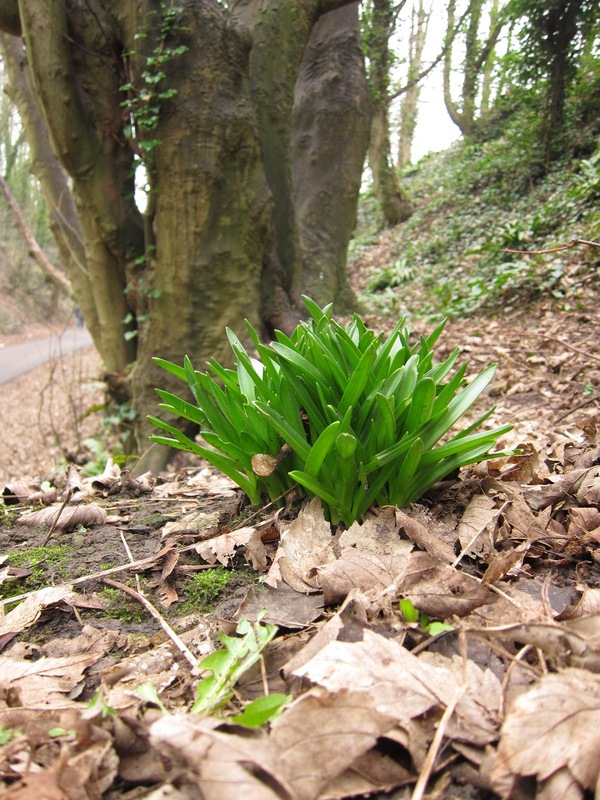 Welcome as a new follower of Loose and Leafy. Hello James. I agree. It is a kind of mission. Hello Cris. You are right. This is an unusual kind of blog. There may be more of them but I haven't come across many others with this approach. 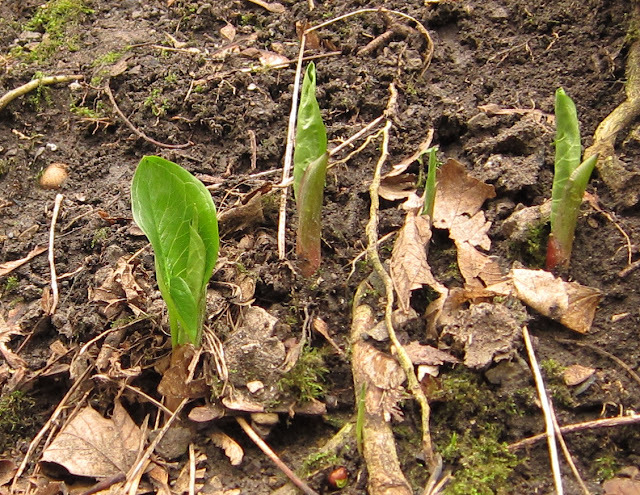 Hello Ash - Arum maculatum - I grew up calling it Jack in the Pulpit but more people seem to call it Lords and Ladies. Guessing . . . I'd think the groups of unfurling leaves suggest a gathering of people and the spike of berries one person standing up to lecture. Hence these two names for the one plant. Hello Kitty. Snowdrops are a plant which don't appear round here. Nor does Winter Aconite. Hello Fer. It will be good if we see the flowers. Unfortunately this is not guaranteed. Something is already nibbling some of the leaves right down to the ground. Everyone - there's a new post on Loose and Leafy. I don't think that observing nature not behaving like it used to, makes it a boring post! Hello Dreamfalcon - and thank you. I would be delighted to take part in The Tree Year Project. Not boring at all Lucy. In fact I just subscribed to your blog so as to find out what happens to this tree and it's little biosphere. i like to track their progress too, so will pop back to see how yours is doing.